I hate to say it but I’m kinda bored of Sandy Hook beaches now. I have over 10 unique images from there and wanted a change. So, I logged on to Google Maps and started some prelim scouting of the Jersey beaches. The closest one which I have not seen was Ocean Grove. 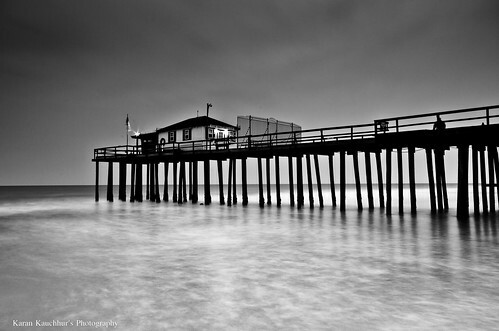 I noticed a fishing pier there and decided that’s what I am going to shoot. I check the weather app on my Android, and it seemed like its going to rain heavy that day. There was a heavy overcast. That kind of turned me off because with the over cast there won’t be any sunset. After pondering over that thought I decided to go anyways. I was hoping that may be last min the clouds might break open and i’ll get a dramatic sky, and if nothing else I can try some B&W shots. I loved the above composition. 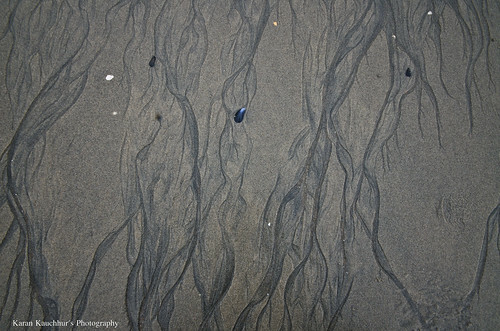 I noticed those small curvy lines on the beach sand because of the low tide moving in towards the pier. I decided to use them in the composition as leading lines. As you can see it gives a nice depth to the image. With just a little contrast in LR I was able to put this together. Since it was a long exposure shot, I got some nice highlights, so decided to try out a B&W version of the same image. I found these line patterns quite interesting so decided to take a shot from up, perpendicular, thought it probably will make a nice abstract. Can probably try to make it a triptych. 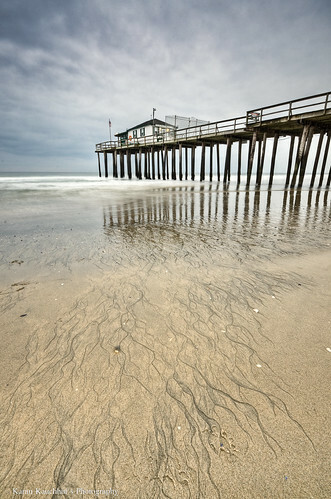 Here are two more shots of the Pier. In the first one I stacked two images, one for high tones and one for shadows. 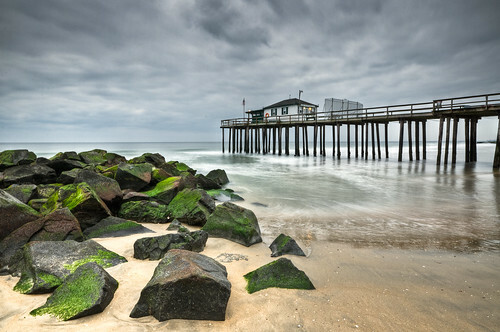 I liked the moss on the rock jetty next to the pier and wanted to highlight those. SO I composed the image such that I get the rocks in the foreground of the image. And then the other one just before night. The tides came in so thought will take a long exposure shot here giving that misty feel on the water surface. In between the shots I noticed these Gulls. 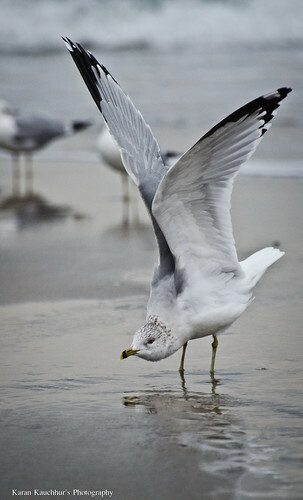 The thing about shooting these Gulls at the beach is that they are so common and there are so many regular shots of these birds. So I sat there and waited for one of them to do something interesting. Luckily for me this one just was about to take off and spread its wings. The funny thing is that it did not take off. For some reason I felt that it was trying to intimidate me because with the wings wide open it kept staring at me. May be she didn’t like what she saw :-). Love these photos – and I appreciate your comments along with them. Nice to know what a photographer is thinking as they compose their shot. Love the black and white pier/lines in the sand one. The contrast in b/w does more for the photo than the color one does. Looked at some of your other work on here. Nice stuff! Looking forward to seeing more. Thank you for your kind comments. And you are right, thats why I wanted to try out a B&W version for the same image.